We are a proficient name in the industry involved in offering 6 Pin Headlight Relay. We are of the leading manufacturers and suppliers of a wide range of Horn Relay & High Beam Headlight Relay. Owing to the diligent efforts of our professionals, who hold expertise in manufacturing, we are able to deliver both standard as well as customized range of heavy duty automotive parts. 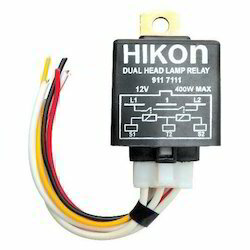 Dual head lamp relay for increasing the power of your headlights. available in both 12v/24v applicable for all cars and commercial wires. 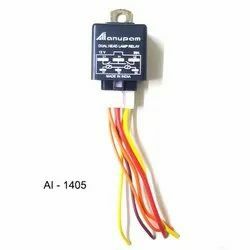 Our range of Car Headlight Relay is made using quality components procured from reliable vendors. This is precisely designed by our team and is thoroughly tested on standards of quality before being delivered to the clients. Aimed at the prosperous growth in this domain, we are involved in offering an excellent quality range of Dual Headlight Relay. Current (Amps): 20,30 & 40amps.